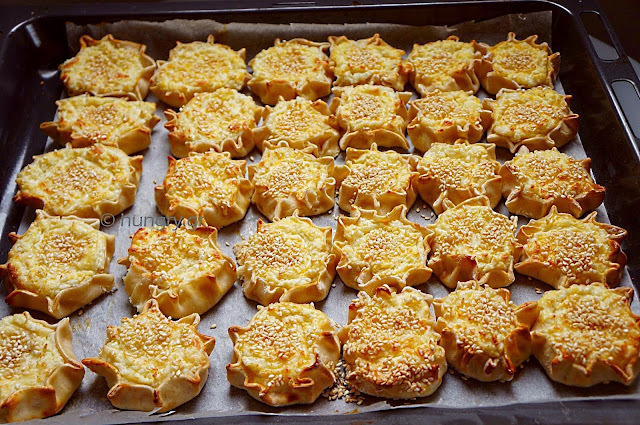 Cheese Pies - small old lamps - traditional eastern pies made in Crete with mozzarella and cottage cheese. Those outside Crete, and those who are not accustomed to the traditional cuisine, will see it as another pie quite complex. The other, who have strong references and relationship with Crete, definitely in sight will moved remembering some Easter childhood or adult life inextricably linked to the traditional customs and culinary habits of their homeland. The pies here in the salty version, made with phyllo, which opened in the machine and cut into uniform discs were then filled with cheese, dusted with sesame and of course in the oven revealed their taste and their wonderful rustic form, which refers to the lamps, which once used to illuminate. 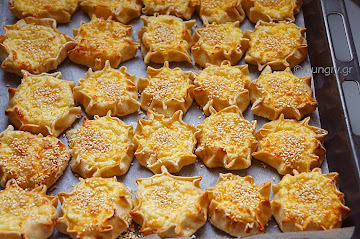 One of the features of traditional Easter dishes in Crete and particularly of Chania is the Cheese Pies - small old lamp (because of their shape). 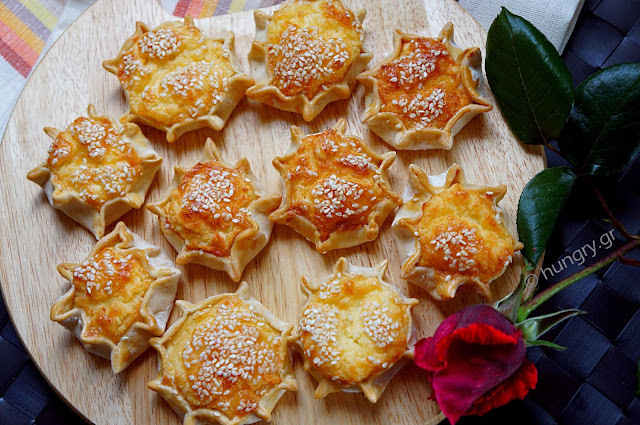 Cheese Pies are many different kinds, sweet or savory, depending on the filling of the sheet and the cooking method. 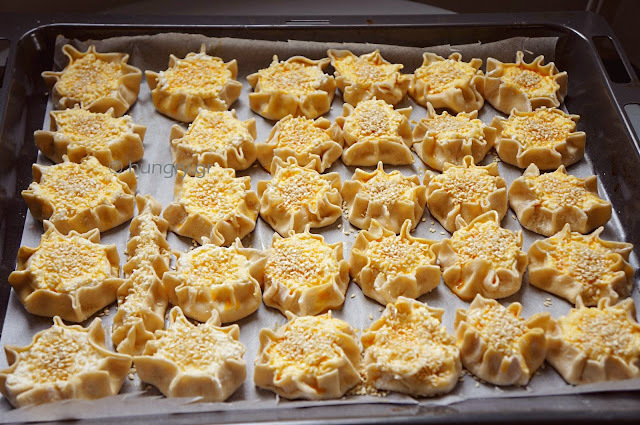 The Cheese Pies are easy to manufacture, but time consuming process. 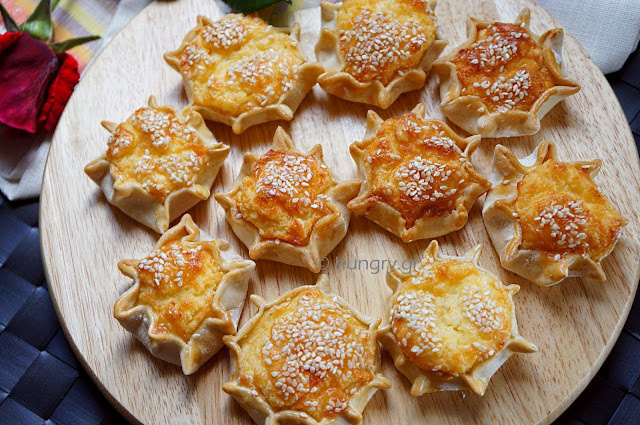 The use of mozzarella, which is required for these Cheese Pies, is what gives them their characteristic taste. Malacca (is used in place of Mozzarella) is the first, soft cheese that if you let it to mature get to be gruyere and is the traditional cheese of western Crete, only with goat's and sheep milk. This cheese is very popular in this area as it is used in traditional Easter Cheese Pies one finds in every home in Chania. 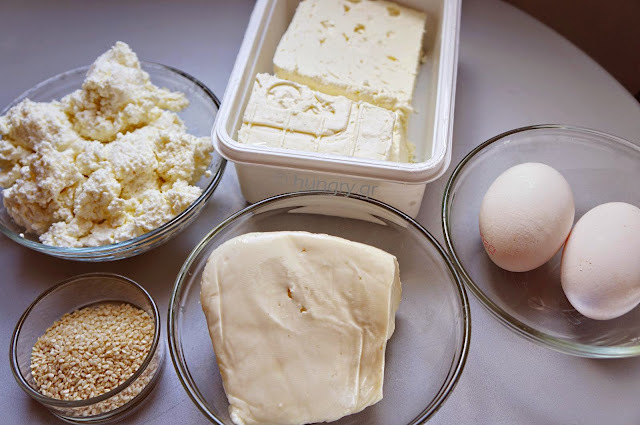 Is unsalted cheese with a smooth flavor and chewy texture, is produced throughout the year but more on Easter as plain or with cream cheese or cream cheese is the raw material for the Cheese Pie Easter. This season -the period of Pascha- tyromalama you can find in almost all stores with Cretan products. Otherwise replace tyromalama with mozzarella into loaf or Cyprus halloumi cheese. The Cheese Pies are eaten hot but also cool are delicious. The sheet is a little hard, straight from the oven, but after a while softened by the moisture. 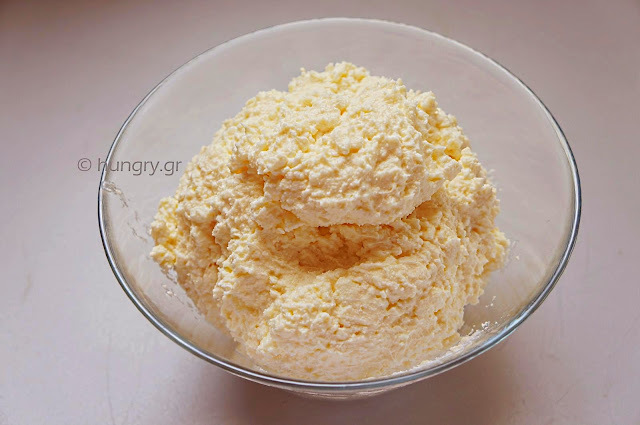 Crumble the feta cheese with a fork and place in a large bowl. Grate in the coarse grater mozzarella and put it too. 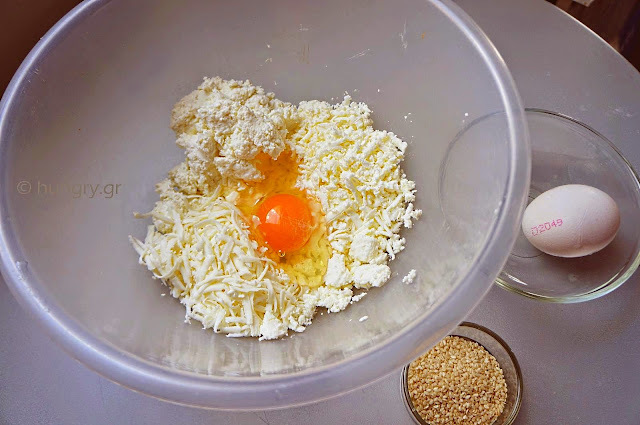 Add the cottage cheese and an egg. Mix well all the ingredients to be homogenized and become a thick cream. Test in the tip of the tongue for salt. 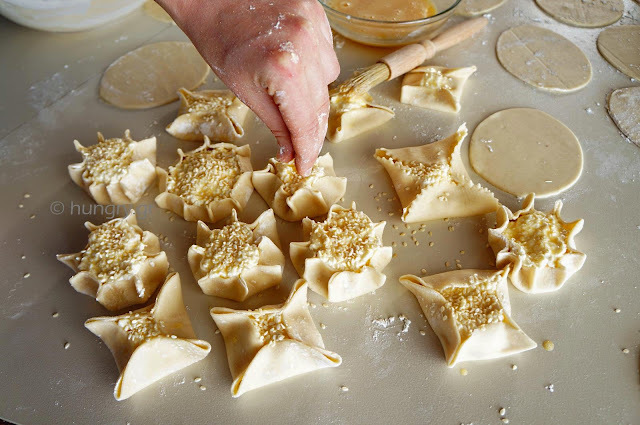 Allow the filling covered in refrigerator until you prepare the dough and then the phyllo. 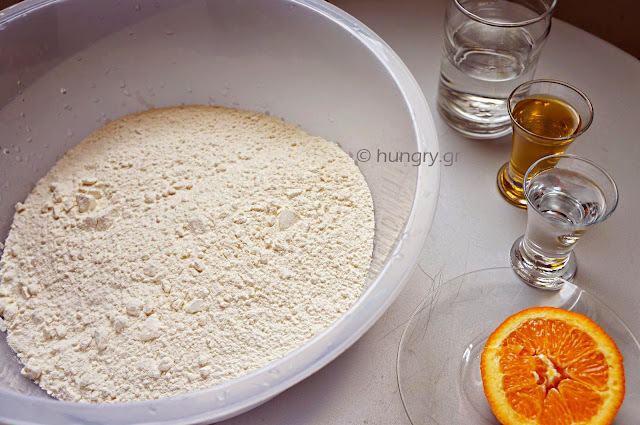 In a large bowl sift the flour and pour into it the salt, oil, raki, the orange juice and gradually, as knead, lukewarm water. 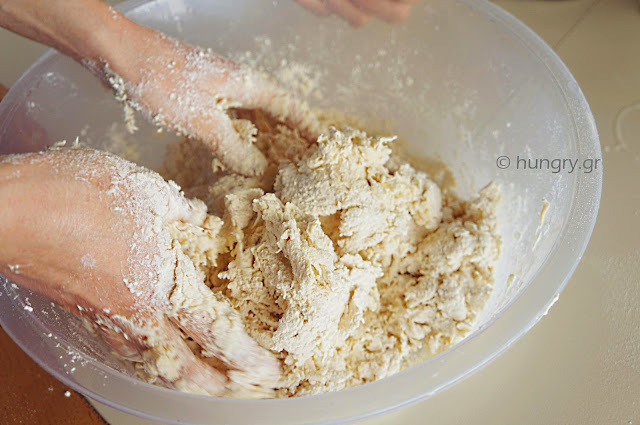 Knead gently, tenderly until we have a beautiful, velvety dough that will not stick to hands. If necessary adjust the ingredients, adding a little warm water or flour accordingly. Cover the pan aside for 30′. 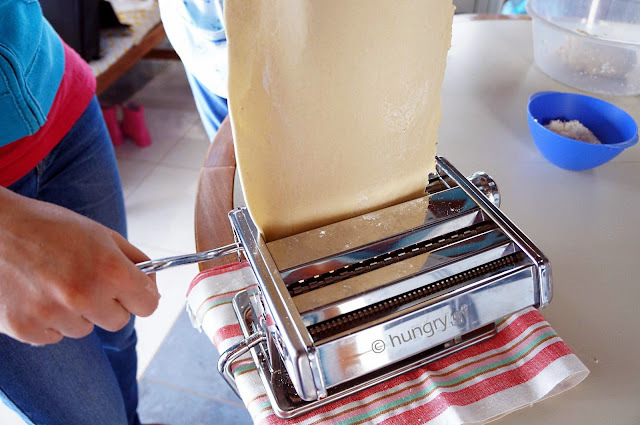 Assemble / attach the sheeting machine on the edge of the worktop and flour lightly. 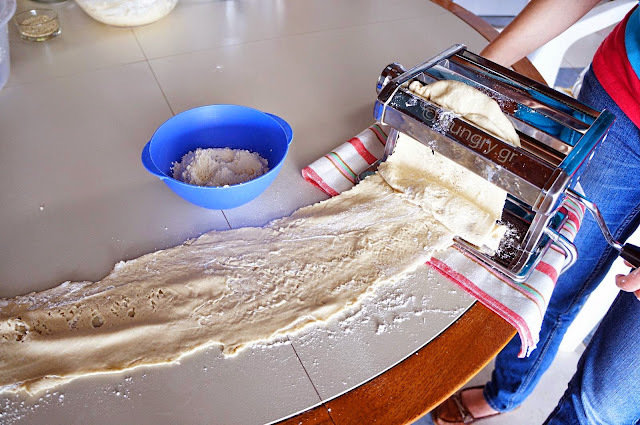 We take a piece of dough and passed by the regulator of the machine in position 1, that the two smooth rollers to open completely. With this first pass the foil strip that will result will not be perfect. It has gaps, tears and irregular shape. Then will be corrected. Every time you pass by the machine, turning the crank, will become more and more perfect and smoother. Repeat this process until you reach the desired thickness. The rising number on the machine, the thinner is the sheet. The leaves are passed folded and sprinkled with a little flour on them and on the bench, twice each setting position of the machine until we reach the finest and most perfect foil that you want. Here the thickness is set to 5, ideal for Cheese Pies. …and with a round dough cutter Ø8cm or with a glass cut round shapes. 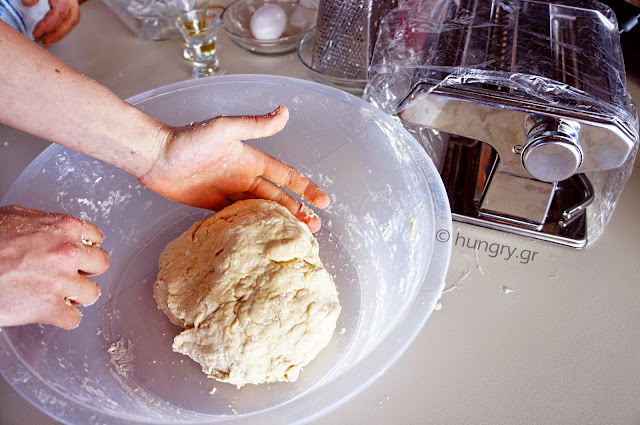 The pieces of dough left over you knead again and incorporate to the next sheet. Do not throw them away. 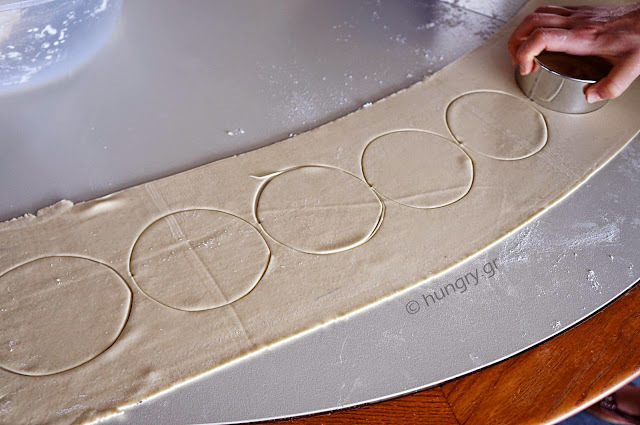 Put about a tablespoon of filling in center of each plate and lift up the dough by pinching the edges to make pleats around like a wreath. Or close them to a file format but without covering the filling completely. The cheese should appear in the center. … and place them in an oven baking sheet lined with greaseproof paper. … or until golden brown cheese, edges are slightly golden but also from below. 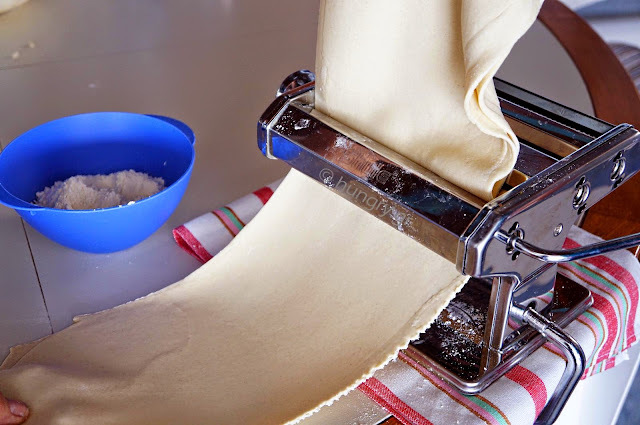 Those who have such a machine will certainly know and use its instructions, as for example do not ever wash it and before the first use you pass a little ball of dough from the rollers, so as to clean everything there since its construction. This dough is throw away. Unless you have a sheeting machine the process can be done by hand. In any case to be two people who will do the kneading and baking times has another grace and faster process. 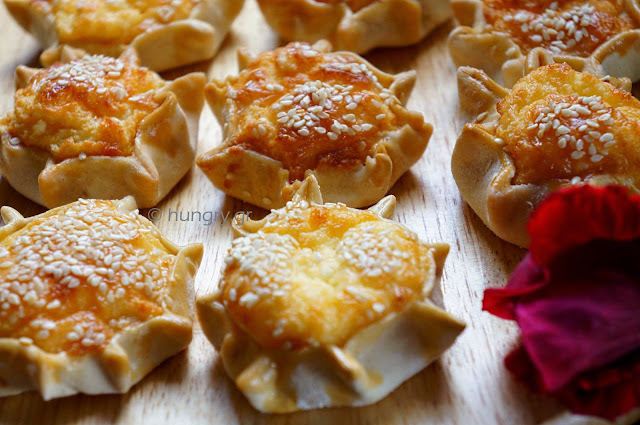 Cheese pies with sesame, ruby, fluffy and delicious. Meze to accompany, specialty snacks, in school, office or outing will be sold out. Go everywhere and eaten by everyone! 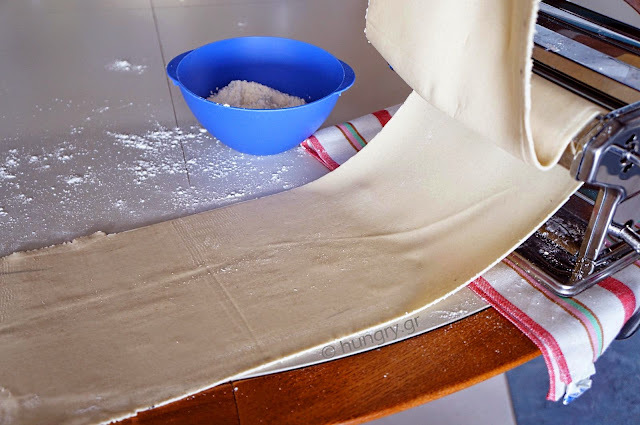 The ready made phyllo enables us to make quick and easy. 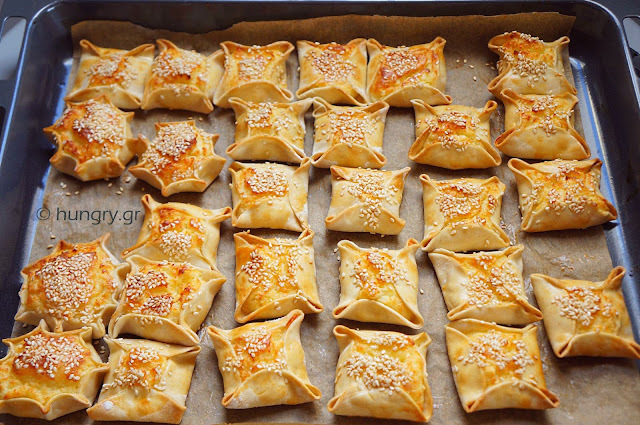 They are filled with feta cheese, yogurt and semolina. A healthy snack made from us. 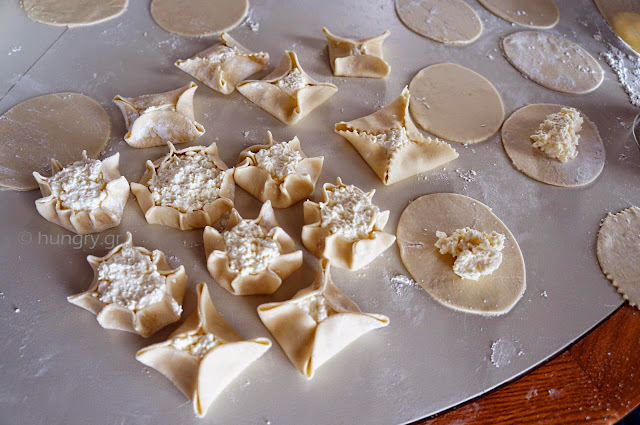 Fluffy, mini pies with dough made with virgin olive oil, that gives them a great flavor without an oily taste, if it is of very good quality. The combination of different cheeses and spearmint gives a balanced and aromatic taste. A delicious snack for all times and seasons. I assure you, they are very pleasantly eaten!